The SEC has established an information page for victims of the alleged Zeek Rewards Ponzi- and pyramid scheme. The Zeek case, which may affect up to 2 million individuals, is spotlighted today on the SEC's main webpage. 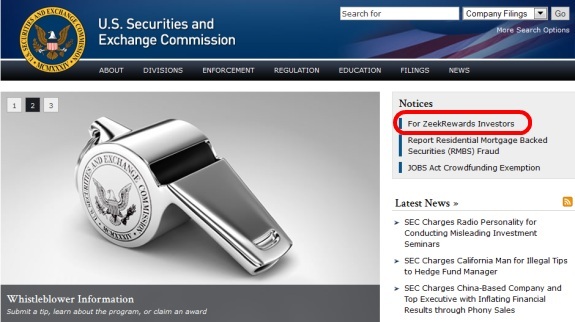 Information for victims of the alleged Zeek Rewards Ponzi scheme is getting top billing on the SEC’s website today, and the agency has established a webpage for Zeek victims. Here is that page, which includes a link to the website of the court-appointed receiver. Kenneth D. Bell is filling that role. Visit the receiver’s website. Zeek was operated by Paul R. Burks and Rex Venture Group LLC of Lexington, N.C. The SEC described Zeek as a $600 million Ponzi- and pyramid that operated online. Apparently, SNR Denton is no longer involved in the affiliates suit, or whatever they were supposedly involved in. Not sure why, but I kind of like to think they couldn’t hold their nose that tight. From the latest E-mail they sent out, SNR Denton is still there law firm. So your letter to SNR Denton Gregg will be an interesting read if they reply. One of the things they let slip out was they said they found a loop hole in Zeek’s program that allowed them to purchase $1 Million Dollars of bids, but was only able to get $100,000 of it back before Zeek was shut down. But Zeek was not a Ponzi. I meant to say “their” law firm. That will teach me to change my thought in mid-sentence. Most likely Denton is gonna be used for something that’s not really related to SEC. In the latest email Lynndel posted to Realscam they changed tack and claim they’re gonna negotiate with the NCDOJ instead. Doesn’t matter what they say….just like scammers guenther and freidman and their ASD scam, they are just there to pilfer more people’s money for themselves. Whip: Doesn’t matter what they say….just like scammers guenther and freidman and their ASD scam, they are just there to pilfer more people’s money for themselves. Well, they did indicate there may be a new law firm involved. The update was so convoluted that who knows what they are now claiming to be doing. But I agree, it is just another way to get more money of the Zeek members to reduce their losses; or so they think.